Who on earth knows which galaxy you’ll find planet fortune, who cares! All we know is that we can get there for 20p a spin, a cheap ticket for any space traveller who doesn’t really want to travel in space. What we want is the slots 2,500 x top win, a robot revolution of moving wilds and magnetic mayhem with its stacked symbols. With 5 reels, a retro space theme and a larger than usual 4 x 5 reels, the Planet Fortune slot is 40 pay lines playable from 20p to £100 a spin. It’s from Play’N Go so there’s the usual fine graphics and there are a couple of features. But it’s weird. Think back to that old sci-fi B movie low budget film of the 60’s, think Barbarella or the Jetson’s cartoon. Hey you’re probably not even old enough! Neither am I. Anyway, the Planet Fortune slot from Play’N Go is a throwback to the future we thought once might happen. It might still happen, but we’re nowhere near it yet. As for the pay table, there’s plenty on offer and winning players can benefit in a number of ways. Reportedly you can win 2,500 x betting stake in this game. The RTP is 96.5% (payout rate) while top symbols can pay 62.5 x your betting stake. It’s a strange amount and not the best jackpot we’ve seen, but the slot has 40 paying lines in its favour. The Planet Fortune jackpot is 1,250 coins. In terms of game design, Play’n Go Planet Fortune is clever and with some nifty extras. As one of the first new slots from Play N Go in 2018 it’s impressive, using the likes of automatic betting adjustments, free spins with walking wilds and mega symbols to keep things interesting. There’s only a couple of negatives that I have. While the futuristic landscape and flying machines looks cool, the music is flawed and is irritating after some time playing. The free spins game can’t be re-triggered either and a good number of the prizes come in lower than the spin cost itself. 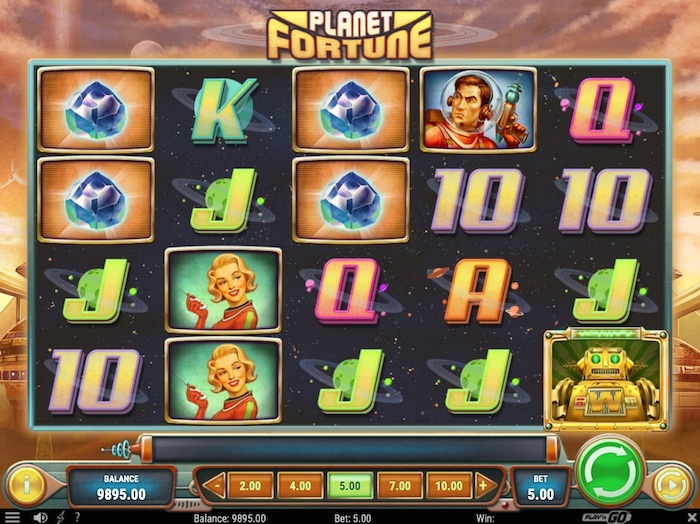 How much can you win playing Planet Fortune? In a slot without multipliers, you’re going to need 5 symbols to win anything remotely worthwhile. I’ve had a good look at the Planet Fortune pay table to see how much you can win if playing for the smallest and biggest bets, 20p or £100 a spin respectively. If you were playing Planet Fortune for 20p a spin, the smallest prize is 2p for 3 x J or 10 symbols while £12.50 is paid out for 5 x wild robots (Biggest prize on pay table). If you’re super lucky and catch the games biggest possible payout of 2,500 x betting stake in the free spins bonus, that would be £500 for your 20p spin investment. Playing at £100 a spin, the smallest prize on the pay table is now £10. You could win £375 for 4 x spacemen symbols or £6,250 for getting 5 x robot wilds. That free spins bonus top whack prize is now £250,000. I’ll keep coming back to it, some of the pay table values look short, but there’s 40 pay lines in play here and big money up for grabs in the features! Planet Fortune from Play’n Go includes a number of extras alongside the 40 pay lines that can help lead to wins. Otherwise it wouldn’t be called Planet Fortune; it would be called Planet with little else going on for 20p a spin. The features include Magnetic Mayhem which is random and involves sticky symbols and Robot Revolution, a free spins game with walking wilds. The slot includes characters that appear in the form of stacked symbols as well. In Magnetic Mayhem, the clues within the title of the feature, it’s totally random too. On each spin, you might notice before the reels stop that they can stick together (magnetise) spinning only mega symbols. These huge symbols can be 2 x 2 and even 3 x 3 symbols in size covering lots of space, and that means potential wins. No sci-fi space slot would be complete without a bonkers sounding free spins bonus sent back from the future. In Planet Fortune it’s called Robot Revolution, another play on words with the turning revolutions of the slots reels. You’ll need 3 or more robot wild symbols to start this bonus, it offers 10 free spins and there’s the added benefit of sticky wilds. But it gets better, these wilds will then move horizontally to the left. I’ve seen Walking Wilds in other new slot games and they work! By that I mean they can really make a difference to your wins by remaining in play, but somewhere else on the reels. Stacked symbols are another feature built into Planet Fortune. In the form of weirdly named Astro-Adam and Extragalactic-Eve, oh and some crystals as well, stacked symbols can appear two or three symbols high and help generate wins. It’s a nice extra that can work well on a 40 pay line slot game. Play’n Go’s intergalactic throwback space slot is good fun with plenty of chances. At 20p for the lowest spin and a possible 2,500 x betting stake on offer, big wins are by no means light years away. How we recommend playing? Go for bets of £2.00 a spin, don’t use the automatic betting adjustments and make your most of any stacked symbols. You’re best wins will come from Robot Revolution while Magnetic Mayhem is good for that mini bankroll boost. Good Luck! What’s good about Planet Fortune? 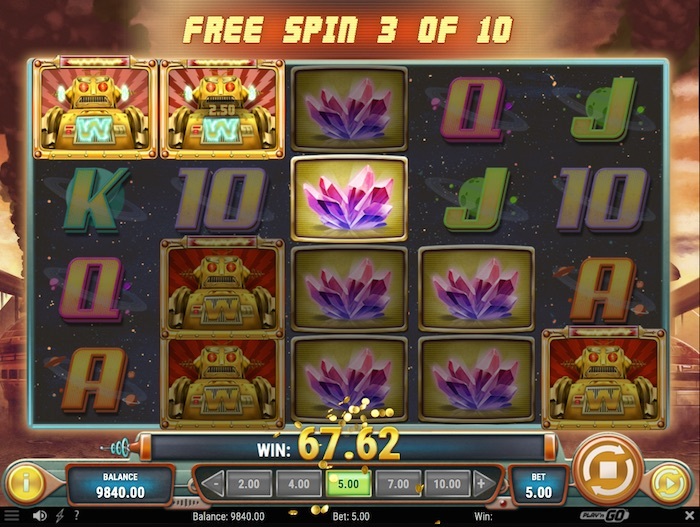 How about free spins with walking wilds, stacked symbols and gameplay that includes magnetised reels! Oh, graphics and sound effects add to the bizarre atmosphere of this sci-fi 20p freeloader. What’s not so good? The music, no re-trigger on the free spins bonus and lots of mediocre prizes on the pay table. Is it worth playing? I think so.